Description: The "Longmont Switch" is a turn job out of Longmont. It does local switching to Fort Collins including interchanging with the GWR at Loveland and Ft. Collins. The "Switch" is passing the Loveland Feed & Grain mill. The mill was built in 1891 and at it's peak could produce 800 100lbs sacks of flour. The structure is constructed of Stone, brick, wood and corrugated sheet metal and was closed in 2004. It has been repurposed as an art gallery. BNSF 2137 was built for the Penn Central in 1970. 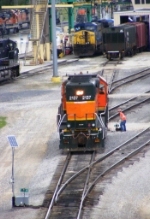 Title: This BNSF unit now modified for a RC unit. Description: BNSF 2137 studded for remote control. This unit began life as Frisco 660. Description: The BNSF 4268 and 2137 switching Doc's Transfer in the Thomas area of Birmingham. Description: Lots of SD75s laying around today. Description: Its kinda sad to see all H3s in the yard know, but I guess all that matters is 6926 is till hangin around. Description: This little guy was on the move. Description: Three yard switcher waiting for the next assignment. Description: What kind of part you need. What size fuel tank do you need?